I grew up in a ‘homemade house’. In large part because we were poor, but also because I was born into a rural heritage of ‘make it do or do without’. My mom sewed most of my clothes, something I didn’t mind when I was smaller, but by high school it was definitely not as cool as Jordache or Gloria Vanderbilt jeans (with the comb stuck in the back pocket, of course! ), so I resorted to selecting patterns from Evan-Picone (I’ll bet my mom still has a pattern like this in her vast collection). Although you might not guess we were poor when you considered our menu (broiled lamb chops for Sunday breakfast, anyone? ), it was because we grew most of our food and it was abundant. So I came to think that anything ‘store-bought’ or that came in a box was inherently better, sweeter with the magic aura of rarity. I didn’t recognize it was actually the high fructose corn syrup and preservatives. 😉 This is also why I am not insulted when the Tartlets ask for store-bought birthday cakes. I understand why they’re ‘better’. I don’t actually remember many sweet treats from my childhood, although I’m sure they were plentiful. I remember each year ordering large tins (like 20 lb or something) of frozen cherries from Agway and how, when I was sent to get some meat or vegetables from the basement freezer, I would sneak them, one at time, from the tin and let it slowly thaw in my mouth but chewing it up quickly before I got to the top of the stairs. No one would ever know! (Why do kids believe that?!) I remember when my mom started taking cake decorating classes and we ate pretty cakes. I remember ice cream — homemade, from Brownlee’s stand, or Wiencek’s Dairy Bar (dipped in chocolate or cherry). But, with a look at that tag cloud, are you surprised that one of my favorites was the Pillsbury Chocolate Macaroon Bundt cake mix, with it’s separate packages for cake, filling, and frosting? I mean . . . chocolate. cake. Says it all, right? 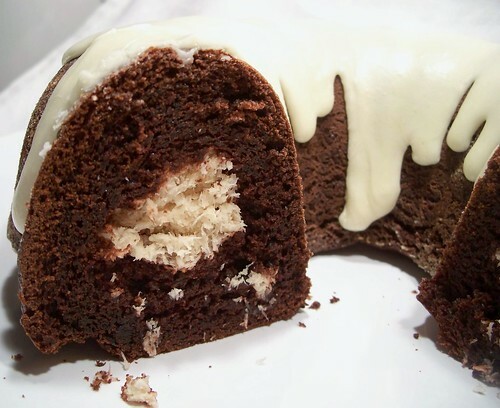 Pillsbury discontinued their Bundt mixes many years ago but, if you are willing to pay for the memory, Nordic Ware offers a gourmet cake mix line at $11/box. I decided to play with making my own. 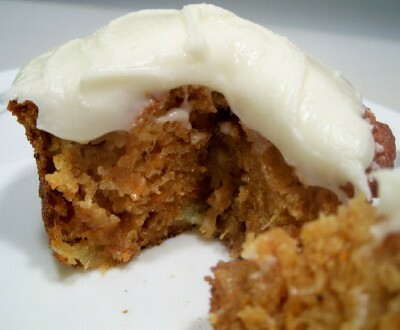 My first attempt, pictured above, was with a finely shredded coconut and for the center I first beat two egg whites to a stiff peak, added some sugar and almond extract, and folded in the coconut. 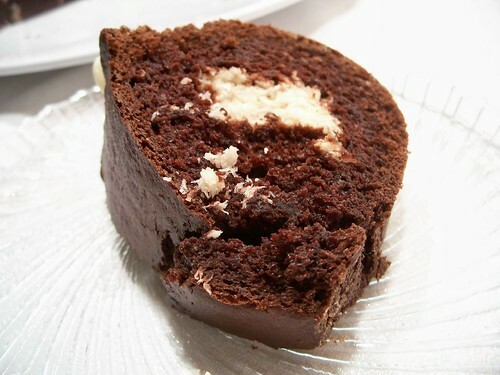 While it yielded the picture-perfect tunnel, my coconut was freezer burnt (BLECH!) 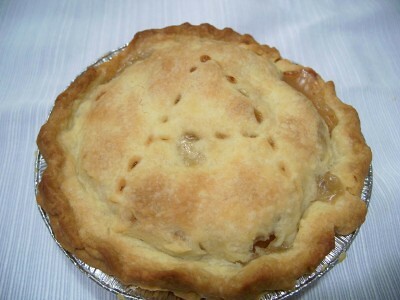 and the texture was far too dry and flaky. The second time I switched methods and used sweetened condensed milk with a couple of egg whites (not beaten) and the extract and coconut. While the second attempt gave a very good texture and taste, it did not form the pretty tunnel. I actually plan to experiment with this a third time. For this walk down memory lane, I thank Rachel of Vampituity who is our creative hostess for this round of Sugar High Friday, created by Jennifer, the Domestic Goddess. Preheat oven to 350 F. Grease and flour Bundt or other tube pan and set aside. Beat together cake ingredients for 2-3 minutes, until smooth and thick, scraping down the sides of the bowl as needed. Spread 1/3 of the cake batter into the prepared pan. Stir together filling until well mixed. Carefully spoon the filling on top of the cake batter, keeping it away from the edges and center of the pan. Spread the remaining batter over the filling. Bake for 35-45 min or until done. Cool for 10 minutes then invert on rack and cool completely. Stir together frosting ingredients, adjusting consistency with milk or sugar. Drizzle over cake. Since the berry fudge didn’t turn out to be the masterpiece I had envisioned, I turned to tarts for Sugar High Friday, that very sweet creation of The Domestic Goddess, Jennifer. 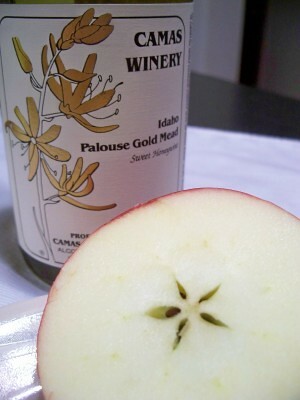 Food Blogga selected the luscious ripeness of berries for the sweetness of this round. 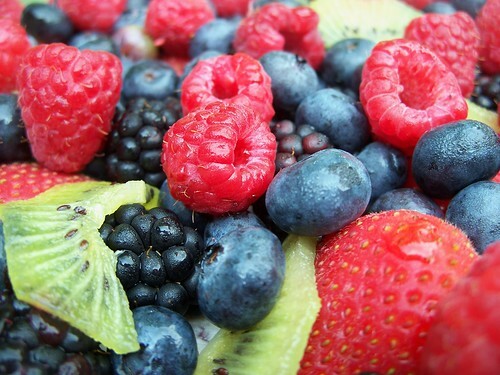 I love berries. 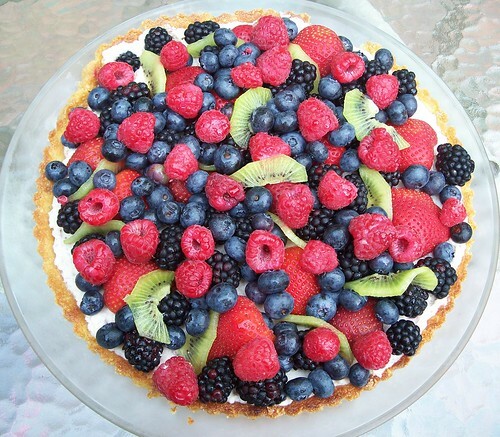 In fact, our entire family loves berries. All kinds. Locally we easily have access to strawberries, blueberries, blackberries, and raspberries, so that’s what I used, in addition to half of a kiwi just for color. To jazz it up from my routine tarts, for my crust I used almond meal, leftover from the Opera Cake. 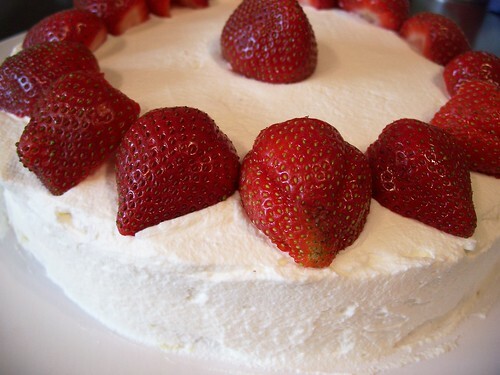 I used mascarpone cheese, white chocolate, and strawberries for a creamy filling. I can’t wait to dig into it! Preheat oven to 400 F. Grease and flour a 10-inch tart pan; set aside. Stir the almond meal, flour, and sugar together to remove the lumps. Cut the butter into the dry ingredients until it is evenly distributed and crumbly. Press into the prepared pan. Bake at 400 F. 12 minutes or until golden brown. Cool. Place the strawberries in a bowl and sprinkle with sugar; set aside. In a heavy pan over low heat, melt chocolate and cream until smooth. Cool. 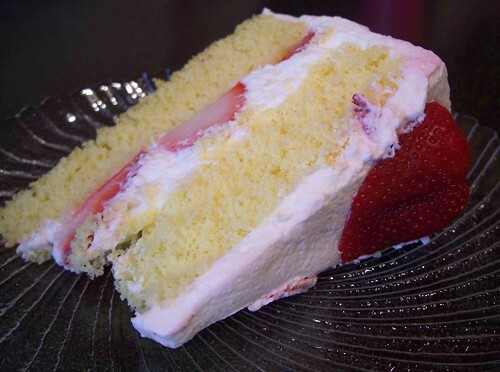 In a medium bowl, beat together mascarpone cheese, strawberry mixture, and white chocolate mixture. Chill if necessary to thicken. Spread into cool crust. 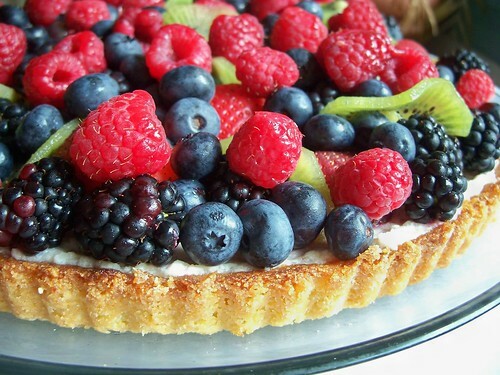 Top with berries as desired. When Tartelette announced the upcoming Sugar High Friday, brainchild of Jennifer of Domestic Goddess, with a theme of citrus, Oh! I had so many ideas. Some of them turned out better in my head than in reality. But the one you see pictured here is among the very best and the concept for it belongs to Tartlet 1. Back when the Daring Bakers tackled the Lemon Meringue Pie, Tartlet 1 loved the meringue but not the lemon filling and asked why the ‘lemon meringue’ didn’t mean meringue, like the meringue mushrooms, but lemon flavored. 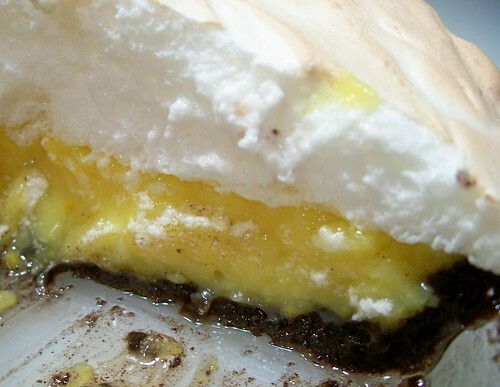 At that time I also had the idea to make an orange meringue pie rather than lemon as I thought it might be more palatable to certain household members. So I did bake an orange meringue pie, using a pie crust made from chocolate sandwich cookies and using the Daring Baker recipe for the filling except using orange rather than lemon and the same meringue recipe. Because I remembered the meringue being quite a lot for the pie, I spread some on the pie and reserved the rest for the lemon meringue experiment. To the remaining meringue I added 1/2 t. lemon extract and about 2 Tbsp. lemon juice and beat it until it was thick and glossy again. 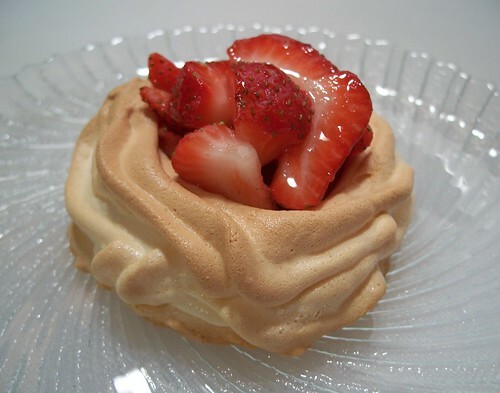 Then I spread a heaping tablespoon of meringue on a parchment sheet and made about a 3-inch circle. Next, I piped meringue around the edge to make a cup. I baked these in a 225 F oven for about 30 minutes. I was hoping they would stay light colored but they did brown. The filling is just strawberries and sugar stirred together. These little meringue cups are my entry to Sugar High Friday. As a bonus, I’ll give you a slice of Orange Meringue Pie too. As promised, I’m back with more information on this birthday cake. Ramona’s birthday is on Tuesday and she said what she would really like to have is a steamed sponge cake such as could be found in a bakery in Taiwan, but sadly unavailable in central Illinois. Just knowing that there was a cake that couldn’t be found here, I was inspired to attempt it. What’s the worst that could happen? Dessert in the name of science. Off to the laboratory, Igor . . . er, the kitchen. Coincidently, La Petite Boulangette selected ‘Asian Invasion’ as the theme for Sugar High Friday (the brilliant blog event created by Jennifer, The Domestic Goddess. Although our hostess suggested using Asian ingredients in a typical dessert, I opted for the dessert requested by my Asian friend. After reading several recipes, I tried this one at Cooks.com. When I got to the actual steaming step, I found that my new 9-inch cake pan was too tall to put the lid on my wok and I don’t have a steamer. What to do? 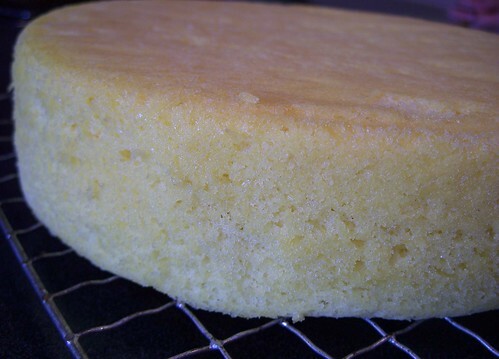 I read a bit online and someone else made their steamed sponge cake in the oven with a water bath and a foil tent. It took over 1.5 hrs for it to finish cooking. 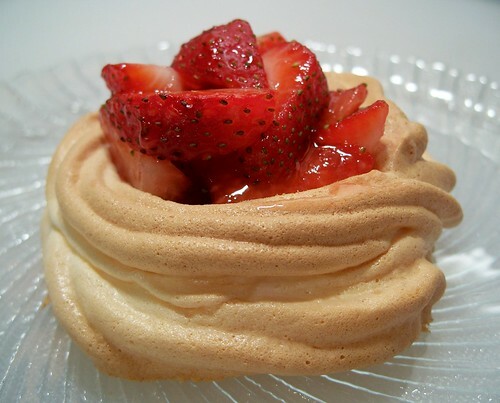 The frosting is slightly sweetened whipping cream and there is a layer of strawberries and whipping cream in the center. The final cake was tasty, but the top was a bit chewy from steaming so long; it also wasn’t as tall as I had expected/hoped. After we analyzed that cake, I decided that I would attempt it at least once more, using almond extract as Ramona said that would be the best (the original calls for lemon but I had orange on hand and used it instead). I also saw another description of making a steamed sponge cake in which the person beat the egg whites separately and I thought that would help achieve the light, airy, delicate texture Ramona described. So I took the recipe I used the first time and separated the eggs and went on from there. But after beating the egg yolks and sugar and folding in the flour, I was left with a thick paste that I couldn’t possibly incorporate egg whites into. So rather than beat the egg whites, I dumped them into the mixing bowl and beat the entire mixture until it was fluffy and looked like cake batter. 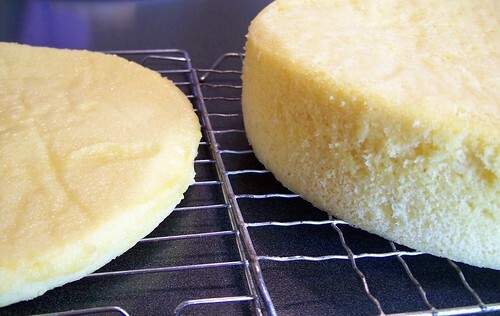 I steamed it in Ramona’s bamboo steamer for about 45 minutes and ended up with the cake on the left below. Despite its Lilliputian size and obvious birthday cake failure it tasted wonderful, but it used the last 1/2 t. of almond extract I had and I was without a vehicle for the day, so I decided to try again with the orange flavor. I followed the original recipe and method again as I did the first time, but using the bamboo steamer (it took over 30 minutes to steam, rather than the 20 minutes in the recipe). That yielded the cake below on the right. The third time was a charm, apparently. It still doesn’t have quite the ‘melt in your mouth’ texture Ramona was looking for, though. It definitely tasted better with the almond extract, however, and if I ever made it again I would certainly want to use the almond. I don’t think this will become the new birthday standard in our house, but it was fun to experiment with a new method. It’s also fun to make special cakes for people, like I did for Crystal (twice, even) and Mrs. V. Happy Birthday, Ramona! 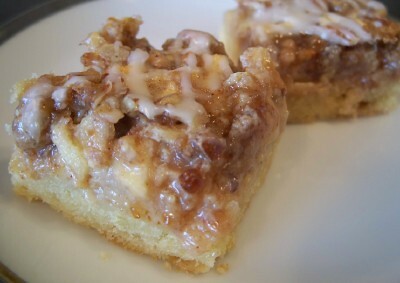 When I saw Candy Recapper’s theme for January’s Sugar High Friday (started by Jennifer of Domestic Goddess), two recipes came to mind, and both of them are from Pillsbury Bake Off cookbooks. One of my great auction finds a few years ago was a box of PBO cookbooks, starting I think with #5 and working up to the late 80’s. I had a few of my own, beginning in the 90’s, so I nearly have a full collection of them! 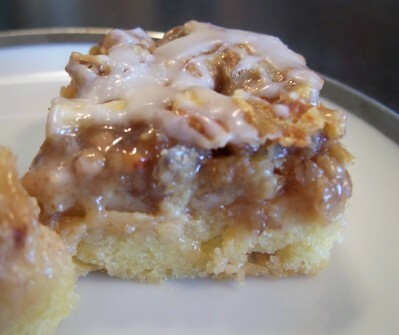 It’s amazing how many popular favorites are former PBO recipes. The one I chose is called ‘Toffee Apple Coffee Time Bars’ by Patricia A. Harmon of Baden, PA from the 1996 PBO. The original recipe calls for coffee in the powdered sugar glaze but, as I’ve told you repeatedly how I feel about coffee and our mutual rejection, my glaze is just plain old vanilla glaze. I love these bars. 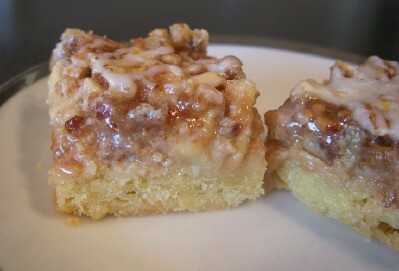 They have a great combination of crunch and gooey, stickiness and definitely qualify for a sugar high. I cut mine a little small so I can trick myself into thinking that it’s not as bad if I have two. Half the pan, however, is still bad, no matter how you slice it. Lightly spoon flour into measuring cup; level off. In medium bowl, combine flour and powdered sugar. Cut in butter until mixture resembles coarse crumbs. Press in bottom of ungreased 9×13-inch pan. Bake for 15 minutes or until set. Meanwhile, in a large bowl, combine sweetened condensed milk, vanilla, cinnamon and egg; blend well. Stir in remaining filling ingredients; mix well. Pour mixture over partially baked crust. 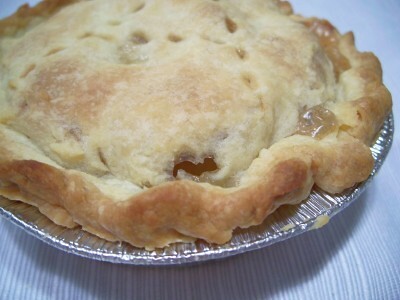 Bake an additional 30-40 minutes, or until filling is set and edges are golden brown. Cool 10 minutes. Run knife around sides of pan to loosen. Cool 1 hour or until completely cooled. In a small bowl, combine glaze ingredients, adding enough milk to achieve desired consistency. Drizzle over bars. Let stand 10 minutes or until glaze is set. Cut into bars. Store in a loosely covered container. It’s truly fall now. Tartlet 1 says it’s Autumn when the leaves are changing color, but once they fall off and have to be raked up — it’s Fall. Autumn is prettier, a little warmer, a nice relief from the humidity of summer, but Fall wags her bony twiggy fingers at us, emptied of leaves, and reminds us of the harsh reality of Winter coming. Now is the time to retreat to the kitchen and make the foods of fall and winter, warming the house from the heart and the oven. Leslie picked a perfect theme for the latest Sugar High Friday — Beta Carotene Harvest. It’s the perfect time for praline sweet potatoes, pumpkin pie, butternut squash, and carrot cake. Tartlet 2 particularly likes carrots and loves the opportunity to peel one and eat it fresh in all its crunchy goodness. I decided I’d make a carrot cake recipe for this SHF, but I wanted something a little different. I modified a few recipes and came up with this one. Some of the modifications were necessary because I ran out of white sugar — while baking for a SHF event? I probably get demerits for that, or something. I would have used half whole wheat flour, if I would have had more than a scraping of that around too. It must be time to go to The Grocery again! I also added a little orange zest, just because I wanted to, and I thought it would taste great with the pineapple and carrot. I baked these as cupcakes rather than a large cake, to make it easier to share. Preheat oven to 375 F. Spray muffin tin and set aside. Combine flour, soda, and salt; set aside. 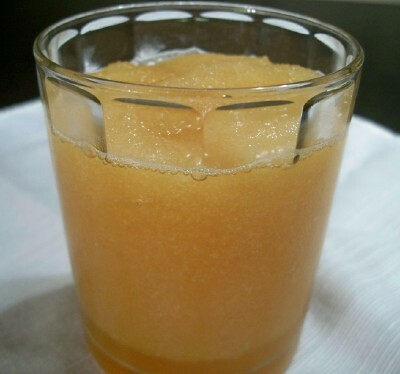 In a large bowl, combine carrots, pineapple, orange zest, applesauce, oil, and sugars. Add eggs, cinnamon, and nutmeg. Add flour mixture and mix well. If desired, stir in 1/2 c. chopped pecans or raisins. Pour into muffin tins. Bake 15-20 minutes. 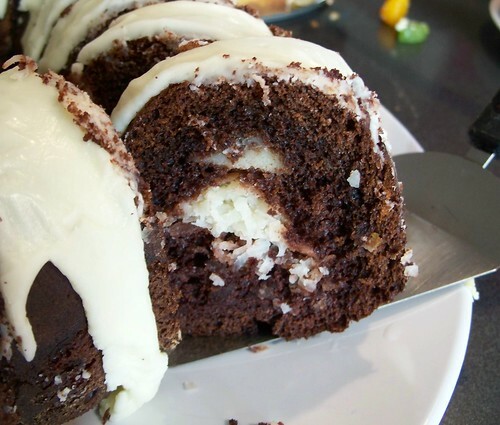 Allow to cool then frost with cream cheese frosting. 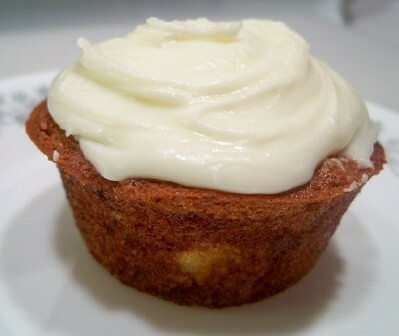 ** These would make great breakfast muffins without the frosting.